The Aurora of March 23/24 1991- Scopeville, Kansas - USA Please click on images to view larger versions. It was not a particularly great observing night at the Kansas Astrophotographers and Observers Society dark sky site located 70 miles southwest of Kansas City. A first quarter moon lit up the clear sky like a beacon and while we waited for it to sink low in the western sky an evening of casual observing took place. Our dark sky observing site dubbed "Scopeville" was only three years old and the newly completed sleeping quarters and warm-up room offered a nice break from the March chill. Around midnight someone noticed that the faint white sky glow of Kansas City far to the northeast seemed to be surrounded by a pinkish cast. Within minutes the area had spread across the northern horizon and bright white spikes of light began shooting up towards Polaris. Bright green regions were seen near the tree line and the whole northern sky began to turn into hundreds of shades of orange, reds and yellows. Cameras were quickly stripped from telescopes and tripods located. Exposures ranged from 20 seconds to a minute on Kodak Ektachrome slide film and color negative asa 400 film. Nikkor 16mm, 28mm and 50mm were used for the shots, all wide open at f2.8. The hardest part of shooting with the 16mm was trying to keep the glare from the first quarter moon out of the frame. For a little more than 2 hours the northern sky danced with color despite the bright moon. The huge, bright white spikes were the highlights of the show as they appeared quickly, grew and brightened and then disappeared just as quickly. At times a few shimmering curtains moved through the green regions close to the horizon. At it's peak, the storm reached nearly from east to west and close to the zenith. Because of the time (after midnight) and the bright moon this storm apparently went un-noticed for the most part. There were no reports in the media and after a few hours we had only the photographs to remember it by. 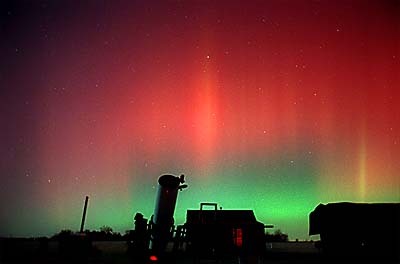 The short-lived aurora was a rare event for Kansas… but little did we know that later that year the best was yet to come.